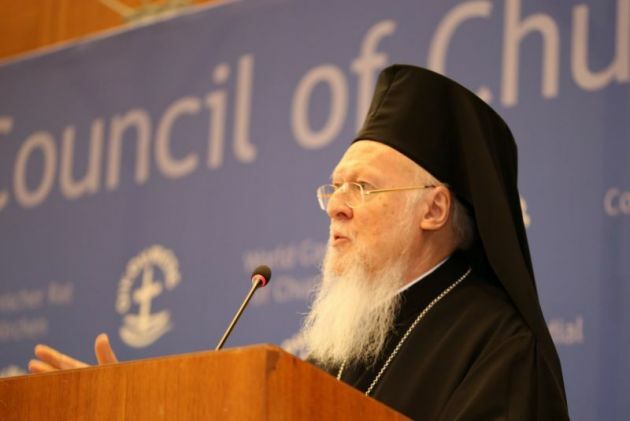 (Photo: © Peter Kenny)Ecumenical Patriarch Bartholomew speaks at the World Council of Churches on April 24, 2017 on why humanity has a duty to protect the environment which is sacred. 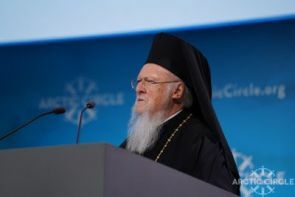 The Ecumenical Patriarch of Constantinople Bartholomew I has called for "a fresh deliberation on the fate of the earth" while delivering a keynote speech during the Arctic Circle Assembly in Reykjavik, Iceland. The assembly drew more than 2,000 participants from 50 countries, joined religious leaders with scientists, government officials, advocates, and indigenous people on Oct. 13-15. Bartholomew recalled a time when religious people were relatively indifferent, and sometimes even hostile, to science. "Today, however," he said, "as some of those connections have become more perceptible and tangible, there is hardly a religious leader in the world who is not in one way or another concerned about the challenges posed by pollution and climate change." A conference organized by the World Council of Churches and hosted by the Evangelical Lutheran Church of Iceland under the theme "Just Peace with Earth" was held in conjunction with the Arctic Assembly. More and more people recognize that religious consciousness and environmental science are both concerned with the ultimate questions, said Bartholomew. He said they are concerned with the way that we are shaping the destiny of humankind, the planet, and the whole of creation, reflected Bartholomew. "For that reason alone, then, spiritual leaders and ecologists cannot avoid engaging in a profound dialogue with one another," he said. "Climate change is a matter of livelihood, food, and individual and cultural survival," he said. And for the indigenous people of the Arctic, climate change is not just a theory but a stark and dangerous reality, said Bartholomew. "It is – above and beyond all else – a vital human issue," he said. "For scientists, the Arctic is the barometer of the globe's environmental health." The ecological misdeeds committed in other regions – including chemical contamination and nuclear radiation – are clearly evident in the Arctic environment, said the patriarch. "When we visit this pristine part of the planet, we cannot hide our eyes, either from the beauty of God's creation or from the changes which human folly has generated," he said. "Nor can we avoid pondering the terrible consequences for the remainder – and the future – of the world, if glaciers continue to melt and sea-levels continue to rise." Creation is an intricate web of life, he noted. "If the environment of the Arctic Circle is now changing at a frightening pace, it is because of economic activities and energy choices in the industrialized world in the south, west and east," he said. At the conference organized by the World Council of Churches, a WCC delegation emphasized the growing role of faith with regard to climate change and sustainable communities. Among speakers at the "Just Peace with Earth" conference was WCC president for Europe and Archbishop emeritus Anders Wejryd. He reflected that, through history most peoples have been totally dependent upon nature, living constantly on the verge, which taught them respect for and care of nature. "Now, that knowledge is nearly only carried on by indigenous peoples, living traditional lives," said Wejryd. "They are the ones most seriously threatened by climate change. And here in the Arctic the rise of temperature is double the level of the world average and destroys lives and civilizations."